Former Pirate Bronson Arroyo and three relievers combined to shut out his old team on six hits last night, resulting in a 4-0 win for the NL Central-leading Cincinnati Reds. It was the 11th game in which the Pirates scored one or zero runs, and was the seventh time in this young season that they've been blanked. The few positives? At least Neil Walker is playing well, with two hits the night after knocking in his first run. And Aki Iwamura had an infield single, which is newsworthy in its own right. The negatives? Other than the fact that the team had no runs, six hits, no extra-base hits, and one runner reach third base against Arroyo, the Pirates' 3-4-5 batters went a combined 1-for-11. But rather than harp on the heart of the lineup, let's give the entire team the credit they deserve for this latest example of an offensive implosion. On the pitching end, Mr. Wonderful was tagged for eight hits and three runs in six innings, which actually lowered his ERA to 5.11. Ohlendorf is still looking for his first victory, and when you combine his numbers with Charlie Morton, the Pirates are 2-12 this season in games they've started - not good, considering they make up 40% of the staff. But it's worth mentioning that in Morton's nine starts, the Pirates' high run total was four, against the Cubs on May 5. Here is his run support, in reverse order: 2, 2, 0, 4, 2, 2, 3, 1, 0, and 1. And for Ohlendorf: 0, 0, 3, 1, and 4. 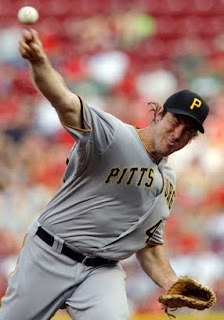 Not coincidentally, the Pirates' two wins came in both instances when they scored four runs. So you've got four shutouts, three one-run games, and four two-runs games in "support" of these two pitchers. Which tells me that if you're named Ohlendorf or Morton, even allowing just one run results in a 67% chance of losing, based on your 2010 offensive numbers. Although they're not great pitchers, those are incredibly tough odds. After this depressing recap, attention now shifts to tonight's game, where the Reds toss out a pitcher named Johnny Cueto who merely one-hit the Bucs in a 9-0 Cincy win on May 11. His opponent? The aforementioned Morton, who should probably plan on throwing a shutout if he wants any shot at a W tonight. You mean to tell me a lineup with a leadoff batter raking at a .170 clip for the season, a 1B batting .184, and a corner OF with ZERO HR in 170 AB can't scrape out some runs? BTW, opposing pitchers are hitting .250 against us......... that's as good as or better than half of our regular lineup. And in case you're wondering, our pitchers have the lowest avg. in the NL. This headline still works if you drop "ly Challenged."